People who put too much material that could be recycled in their general waste bin could risk having their refuse collection stopped all together. 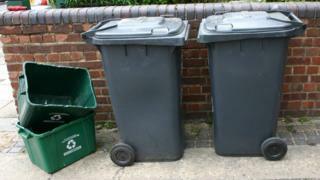 It is one of a number of measures being considered by Swindon Borough Council in an attempt to boost recycling. Council bosses said last year 1,556 tonnes of metal cans had also been placed in the general refuse. Recycling in the town has fallen over the past five years, from 48% in 2011/12 to 38% in 2016/17. In 2017/18 the authority collected a total of 92,522 tonnes of waste and recycling of which 40% was re-used, recycled or composted, 56% was converted into fuel at Swindon's solid recovered fuel plant in Cheney Manor, and 4% sent to landfill. The EU Waste Framework Directive sets a legal requirement for the UK to recycle at least 50% of household waste by 2020, 55% by 2025 and 60% by 2030. The authority said one of the other options is to temporarily stop having a separate plastics collection. Until recently much of that had been sent to China for reprocessing. It said if householders put plastics in with the main refuse, it too would be processed into fuel and also avoid the risk of it being dumped inappropriately. However, the council accepted the measure was not a long-term solution. Council bosses said last year 1,556 tonnes of metal cans had also been placed in the general refuse adding if these had been correctly sorted it would have saved the authority almost £190,000 in disposal costs. They also hope by householders putting glass, paper and card in the appropriate recycling bin it will make plastic recycling collections more feasible in the future. It is asking residents to give feedback on the proposals in an online survey. Video What really happens to 'recycling' plastic?